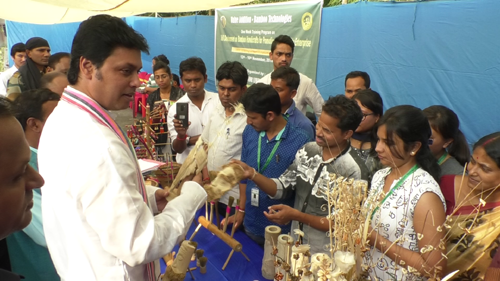 Tripura Chief Minister Biplab Kumar Deb interacted with the bamboo and cane handicraft artisans, bamboo producers, entrepreneurs engaged with the sector and students of the state studying bamboo management. The purpose of the interaction was to know directly from them the problems they face in the sector right from procuring raw materials, production and sale of the finished products. The meeting was organized by the Forest research centre for livelihood extension, Salbagan forest complex in the sideline of the one-week training in the value addition bamboo technologies through skill development of bamboo handicrafts for the promotion of community enterprises. Deb also the Handloom and Handicraft Minister of the state has been emphasizing on cultivation of bamboo in the state so that the farmers can get fast return within two years of plantation and thus double their income before the target set up in 2022. According to a survey, more than 1.3 lakh families are directly or indirectly involved with the handloom, handicraft mainly engaged in making of bamboo decorative, utility, and fancy materials. The artisans a large section of who are women were very happy as they could directly interact with the Chief Minister and express their problem. Meantime, the Chief Minister emphasized on proper implementation of various central schemes aimed towards the benefit of artisans beside skill development and e-marketing to reach larger market avoiding the middleman so that the farmers and artisans get the direct benefit. He also distributed prizes among the various artisans who took part and displayed various of the hand-made bamboo products including showpieces, ornaments, utility products etc which has huge demand outside the state but requires proper exposure.